CLICK ON THE IMAGES TO SEE YOUTUBE EXCERTS OF THE SHOWS. 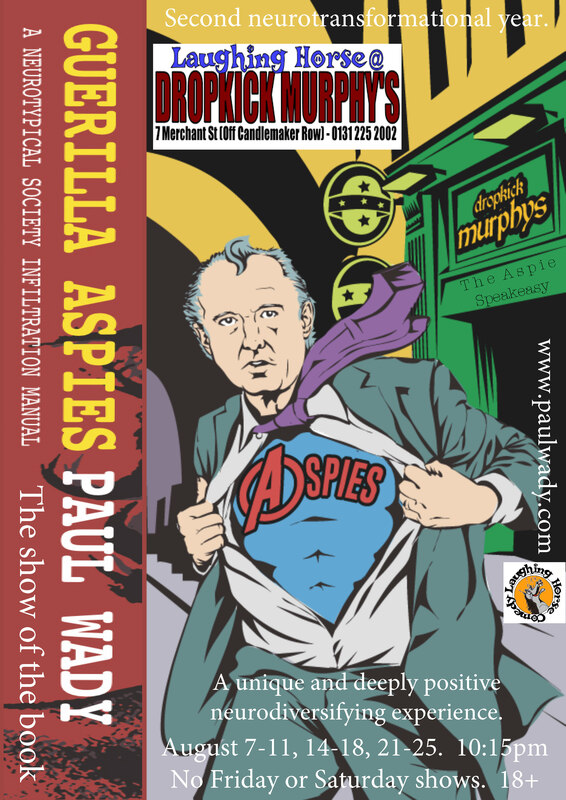 Interview with Guy Wah – what is the Guerilla Aspies show? A great explanatory interview about the show here. 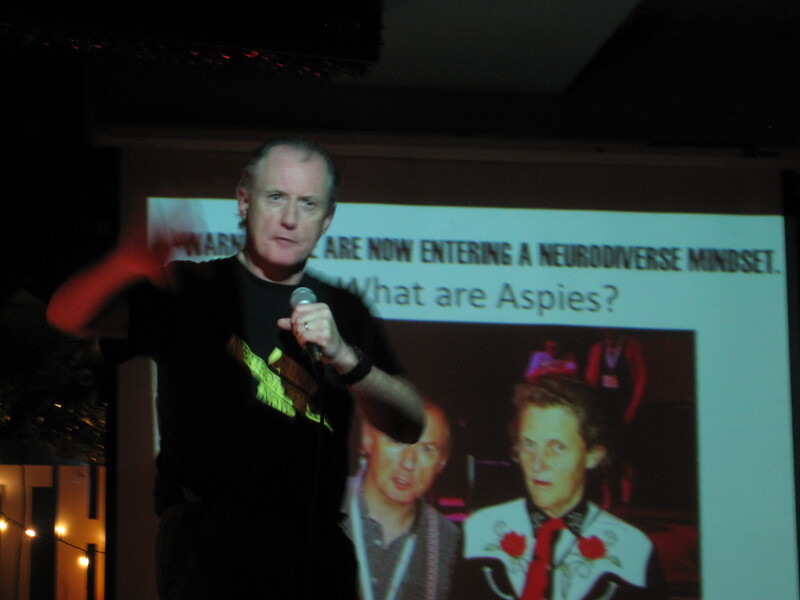 First performed end of 2014 in the Finsbury Tavern, the Guerilla Aspies stage show converts whole audiences to autism. Simple as that. 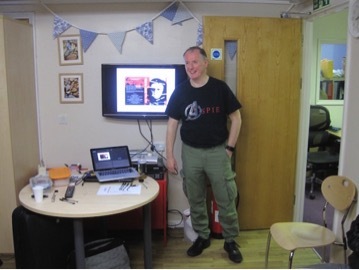 It is fun, challenging and I am told, works for autistic people. Which is the main thing for me. 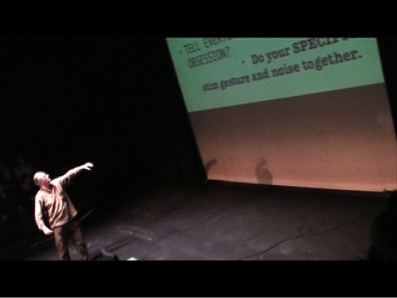 Since the show is audience participatory and thus interactive each one has been a unique encounter with the audiences. 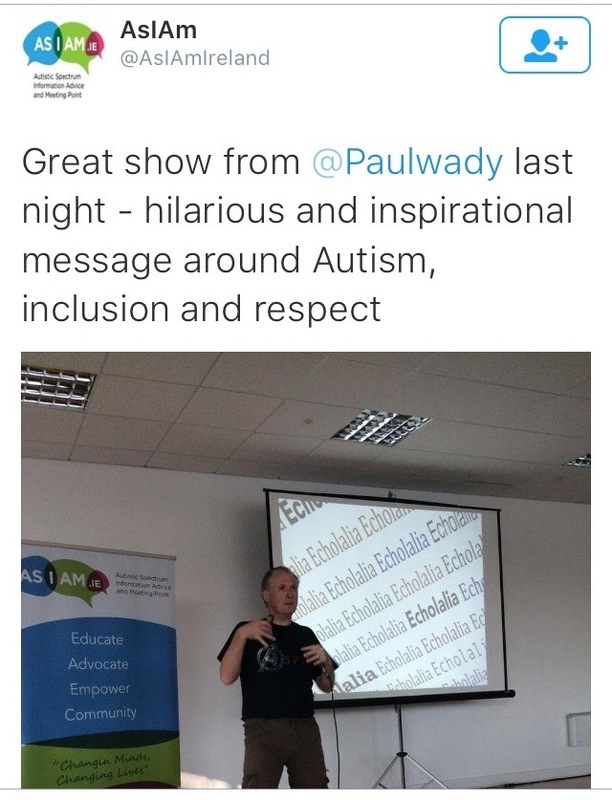 My Dublin show in September was partly a double act with an 11 year old Aspie in the front row, and a small group of us at the very back. Great stuff. 2016 Edinburgh run was a slightly different event for each of the 15 shows over the 3 weeks. I seriously lost 28 years and got to be my old 24 self again. My body felt different and re galvanised to perform. Wonderful. Often I have to find a whole new way of explaining its many parts on account of my heavy ADHD component. King speeder here with his memory with a mind of its own can recite whole Poe poems at length, but not be certain what I can retrieve from my head at will. Weird thing is, stuff is usually in there somewhere. Welcome to the mind of an autistic. So who knows what I will be able to salvage from the formal lines and structure I wrote, across the group encounter that is each show. Thus it is always interesting and fresh for everyone. I am used to having that gun to my head and so the all important ingredient of SHARING THE FUN WITH THE AUDIENCE is always present. THE MOST RECENT SHOWS FIRST. I RETURN TO THE EDINBURGH FESTIVAL. New slides – same old obsessions. CRAZY! I performed an 85 minute set in the Caveat bar, Lower East Side of Manhattan. A science themed performance night club with an integral bookshop, describing itself as a cross between CBGB and the Yale University bar. 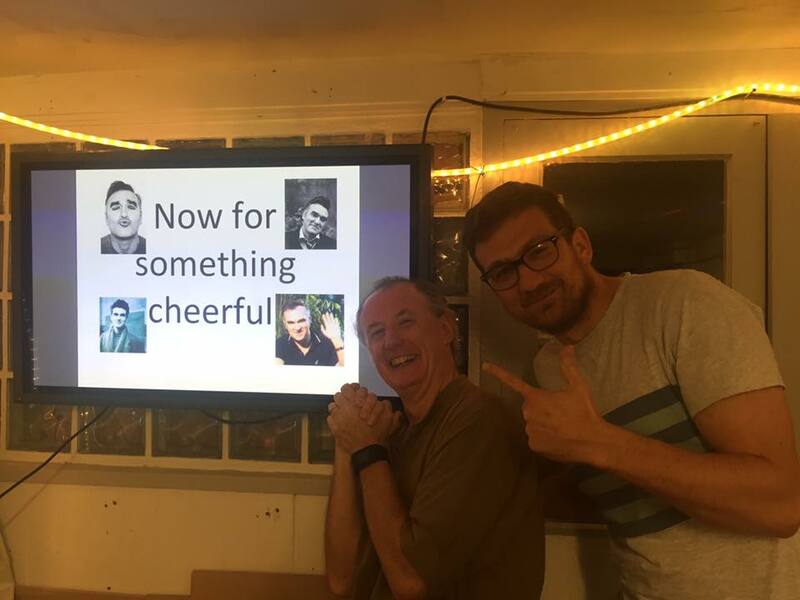 Thank you to every who came, Daniel my school friend from when we were ten years of age (in the pictures), Anders for suggesting the venue, and Prof Ken for attending all the way from Boston. The staff liked it and said they would re host the show. Blimey, as we say in Blighty. We went on to have a fascinating tour of the Jewish culture of the area, and ended up on top of the Empire State building. (We used the lift. Getting a bit old to climb it now). I even managed to visit Edgar Allan Poe’s Fordham cottage. He was not in. (I went home a day early to support my wife, for all you autistic pedantics). Kent university campus in Canterbury. 29-30th May. A very important event. I was able to see all the other shows like my own, such as Cian Binchy’s The Mysfit Analysis which is as old as mine, together with his new and challenging piece. Madhouse – Catch The Baby. 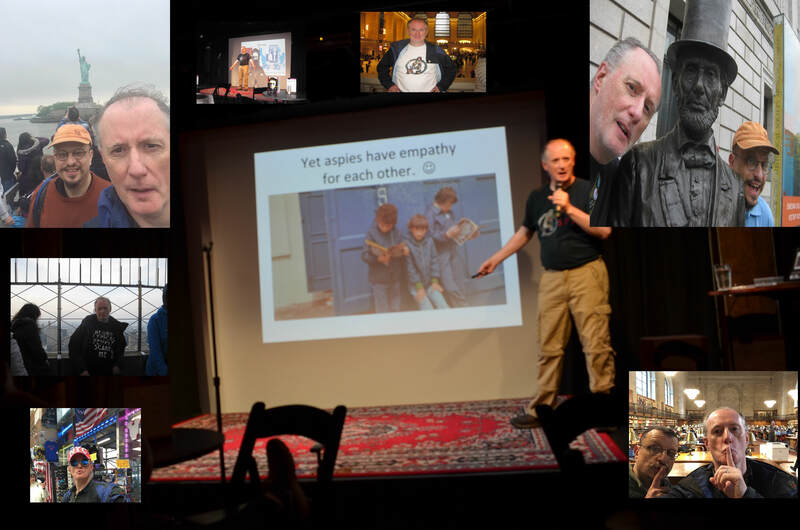 Annette Foster premiered The Adventures of Super Aspie Grrrl and Daniel Bendelman created an environment about the demise of the Aspergers Syndrome diagnosis form the infamous DSM 5 book. (The Diagnostic and statistic manual of mental disorders book). 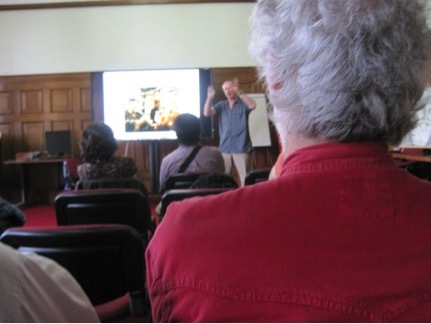 There were films shown such as Citizen Autistic, and an art exhibition of work. 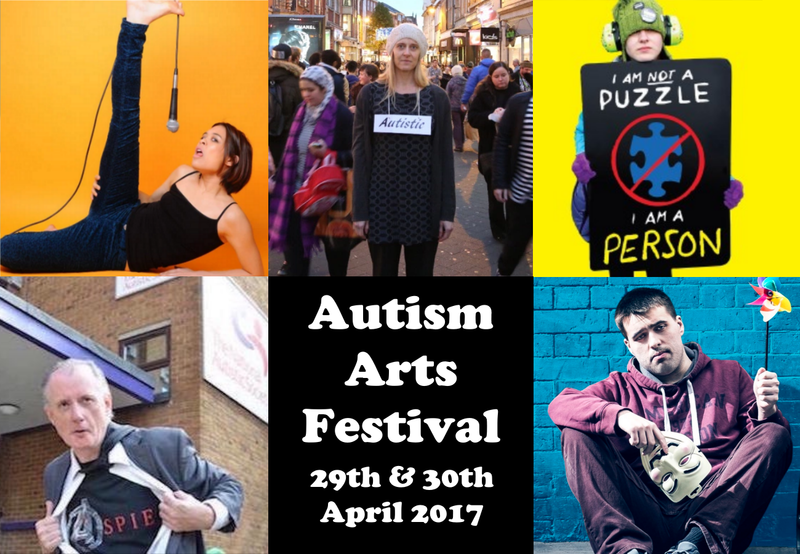 It was great to be part of the first wave of us, all together personally and experiencing an autistic performance and art space working well. 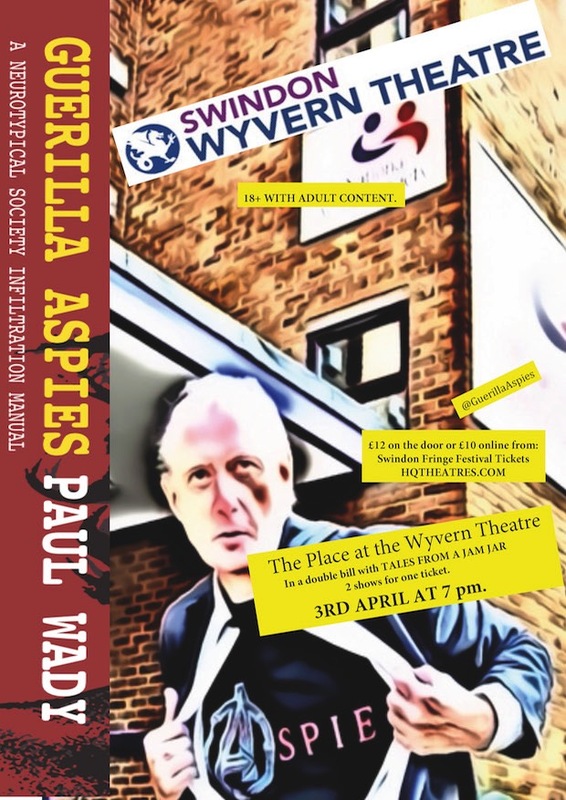 March: Return to the Braintree Foyer, Essex. Giving a nice young man my book in the Braintree Foyer Essex, where I rediscovered the show yet again with a new generation. Will I ever get a decent picture of me without that bloody toothy smile? The Social bar, central London, December 2016. 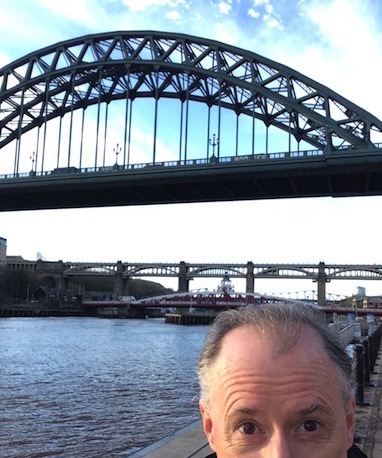 Link to FringeReview – it’s a good ‘un. Thank you to Guy Wah for the pictures. The producer and actor Guy Wah had me come up this evening to play for Assert, introduced me to his partner Maddie and whisked me off to the Sweet Dukebox theatre for a great show. 25 people attended, and a fine audience they were. Full of great reactions and laughter. 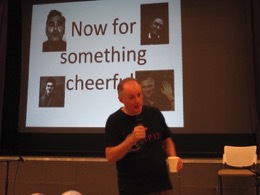 Good responses too and a man called Robert in the front row did a great double act with me. Turns out he is an aspie who left school with no qualifications and ended up with a phd from Cambridge who will be doing my review. It was lovely to perform and an important show in a proper small black walled proscenium arched venue. One reason being what went wrong. The projector died half way through. So I did the rest holding the laptop and running round everyone like a waiter. This went down real good. I was able to act out the social stories as mimes as I did then. Do I need a big ipad Touch Pro to try that with as a street version? Well I am looking into it. 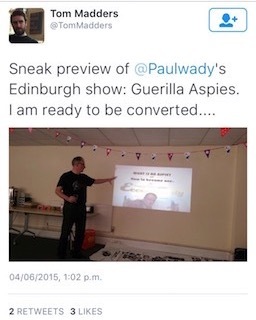 Could even be the start of the Guerilla Aspies Lapdance Show, in which a (nearly) 53 year old man will give you a personal performance, 1 to 1 etc? Mind boggling. Thank you to Angus – Matthew Edmondson – for the picture. Voodoo Rooms, Edinburgh, September 2016. The 11th International European Autism congress. The Autistic Rights Group Highland Fringe event. (Information about this is on the link above). 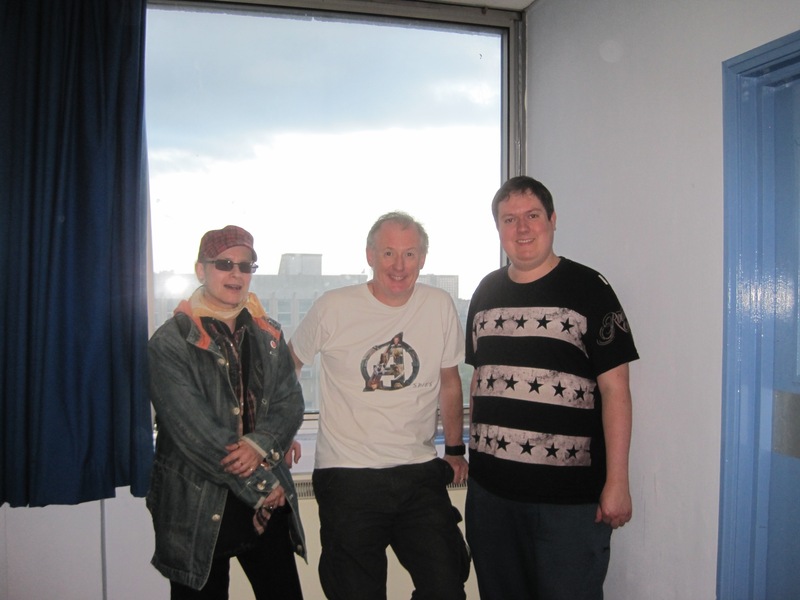 I was brought up to Edinburgh only a few weeks after I had left the festival to play for the Autistic Rights Group Highlands at their Fringe event to the International Congress. An honour. 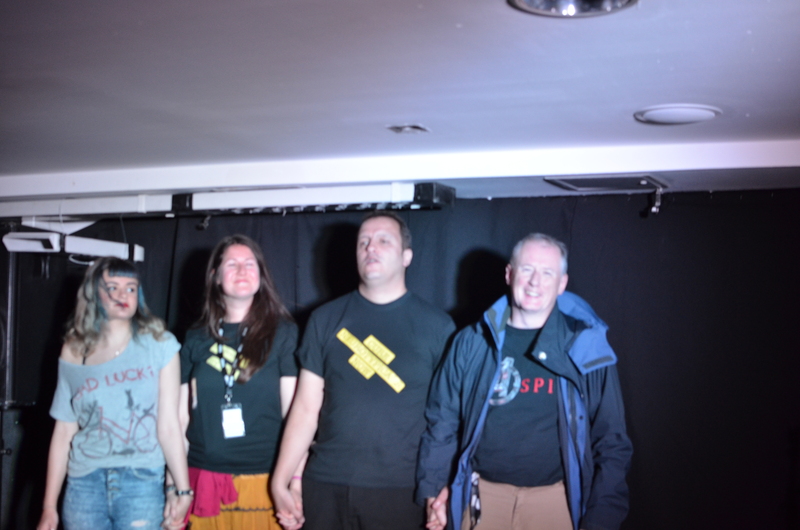 We took over the Voodoo Rooms and four of my pals spoke first. Dr. Damian Milton, Caroline Hearst of Autangel, Martijn Dekker and Dr. Larry Arnold, both of Autscape. Then I came on the end about 10:40 and finished the evening off. 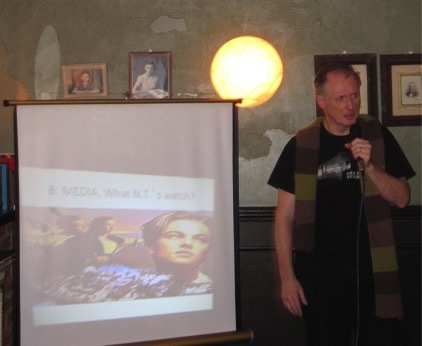 I was very moved how much good response I got from the 50 strong crowd of, well, my peers. 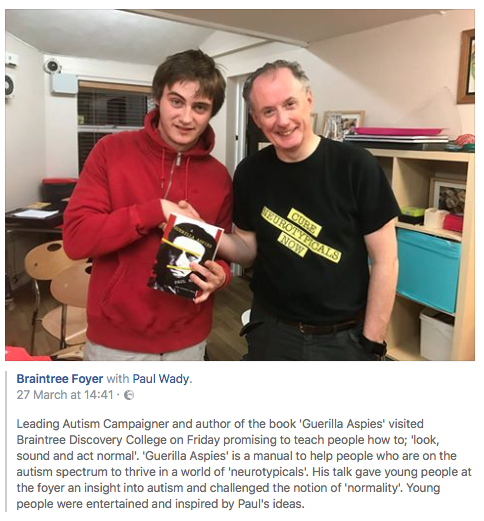 If this extraordinary audience of autistic advocates and scholars liked it, I will be carrying on performing it indefinitely. 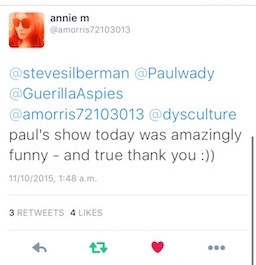 FINALLY A REVIEW: Edinburgh festival August 2016. 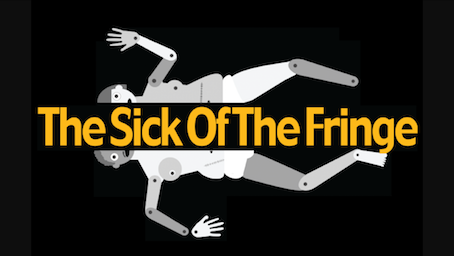 Thank you to Sick of the Fringe for a great write up. who masterminded over 100 shows at the legendary Montague Arms venue. Some very useful feedback which has caused me to revise the show, all for the better. This has been a very productive time in the evolution of what remains a thing to create without precedent. I had no template when I created the piece and still do not. So any views or ideas are much valued. Great venue and staff, and good fun doing it. Being last I get all the time I want to discuss and debate with audiences. Then you can sit down and use the bar. 🙂 I had a great 15 show three week run. Last show got the biggest audience and got some recognition as you can see? Also spent 3 weeks walking around Edinburgh every single day wearing the t shirt you can see, or the Aspies one. 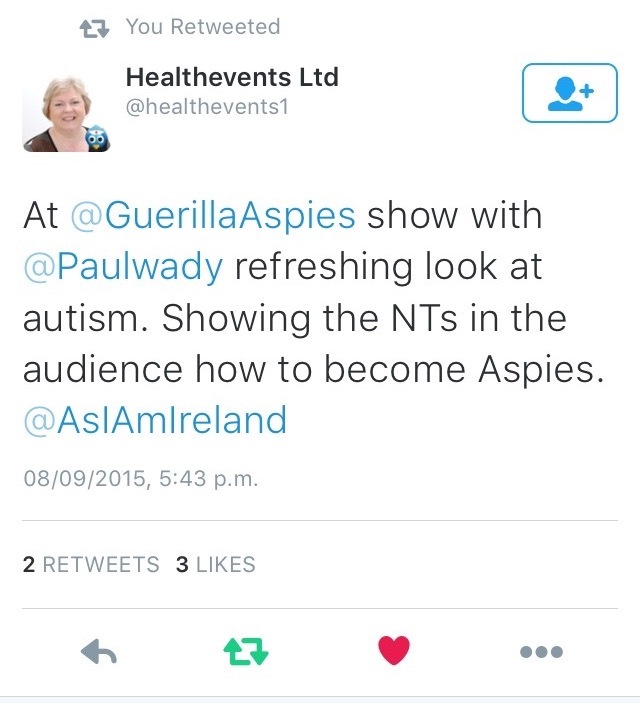 A unique event in the history of neurodiversity self advocacy if you ask me? Met lots of aspies and got great feedback. Evolved the show to something much more effective too. Roll on 2017 and all being well, TWO SHOWS. 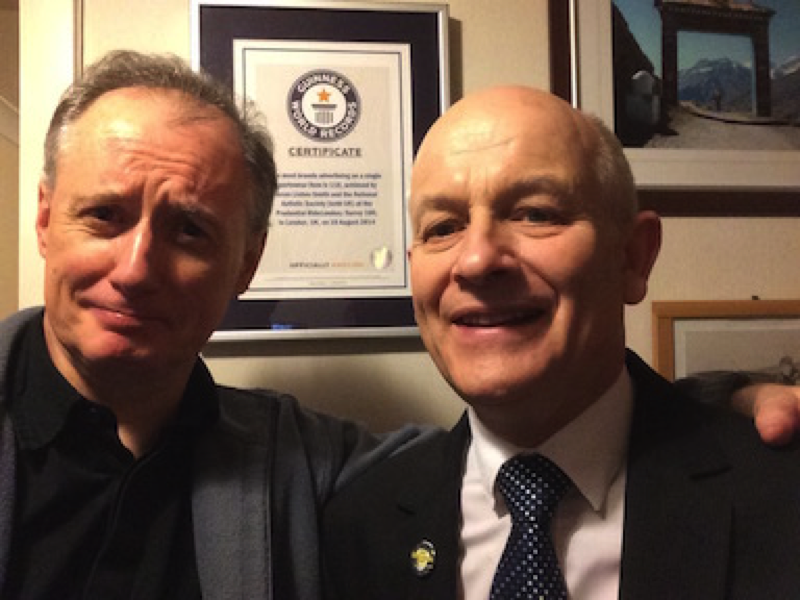 This one and the next project…aha..
and my old pal Mark attended. Little did he realise that this part of the show was dedicated to him. He being the man who took me to so many Morrissey shows that I became a true convert. Let Mozzer’s name be praised. A pleasant surprise for Mark. Thanks to everyone who came. I was invited to play this local hotspot on sunday the 12th June, 2016 at 6pm. A fine gig with many pals present. Within the week the new landlords had shut the place down. So the occupants re occupied and staged an occupation. Good luck to all and maybe I’ll be back as requested, if it ever gets re opened and is still in one piece. I found myself next to the best of the best. I was unworthy.. 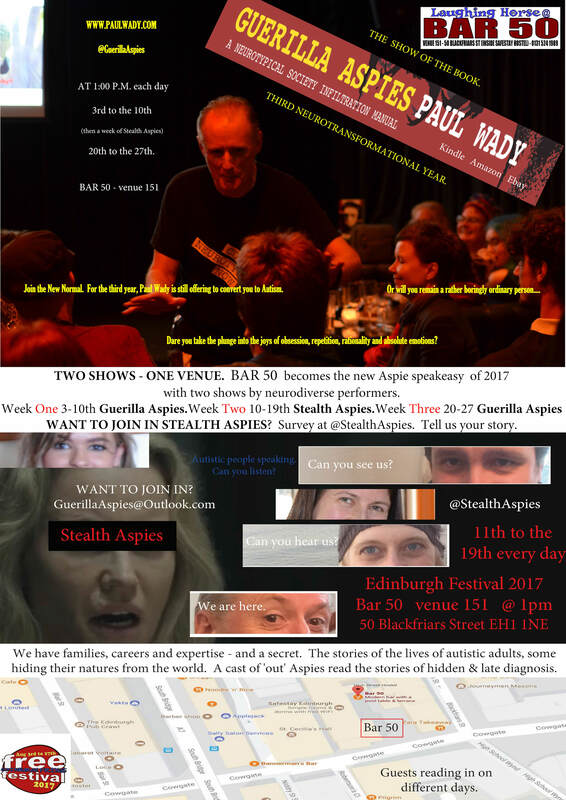 THE BRIGHTON FRINGE SHOWS, 4TH AND 5TH OF JUNE 2016. These went well. Some old friends came to see me, which is always wonderful as they get to see who and what I am to such a degree. The luxury of relating and sincerity was not something my previous, undiagnosed life afforded me. The Caroline of Brunswick was a fine venue to use. ASSERT CHARITY, BRIGHTON, 25th May 2016. 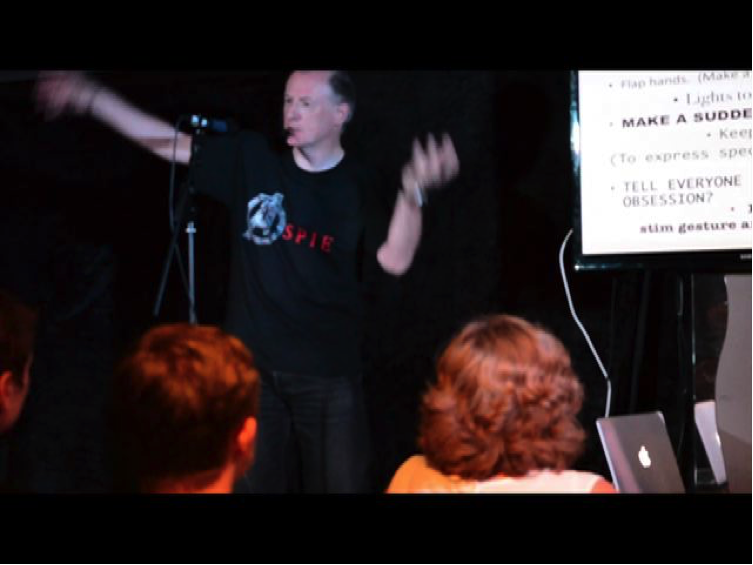 I was invited to come perform for about 40 people, mainly Aspies. 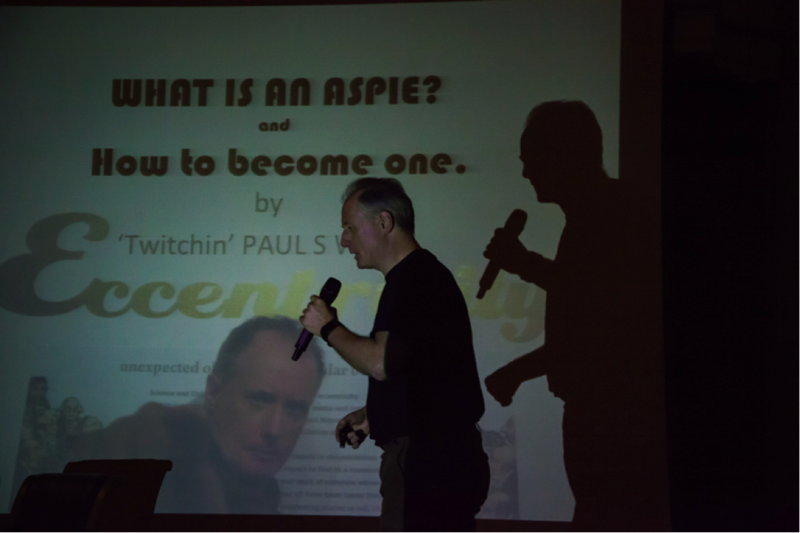 I got to meet many of the Brighton Aspie community and had a great show interacting. 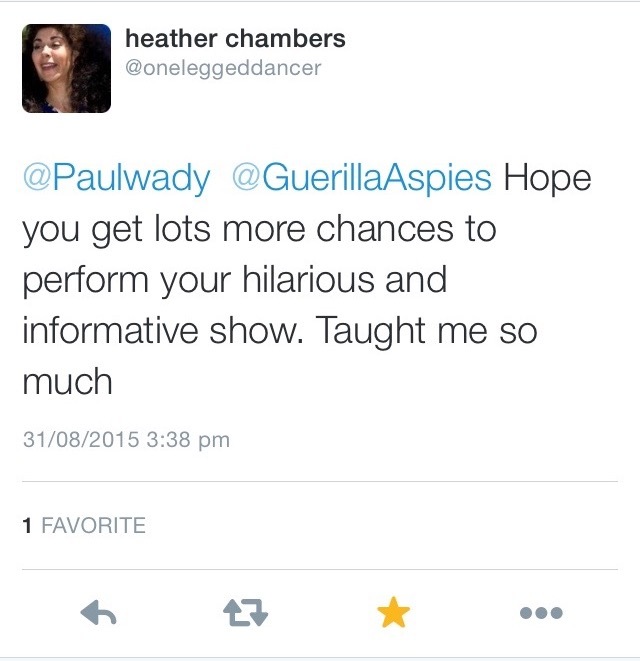 Two women brought friends to the subsequent Brighton Fringe shows two weeks later. Thank you 🙂 It was a big and fascinating audience and we all used a room at the top of a building virtually on the waterfront. BRAINTREE DISCOVERY COLLEGE, 28TH April. 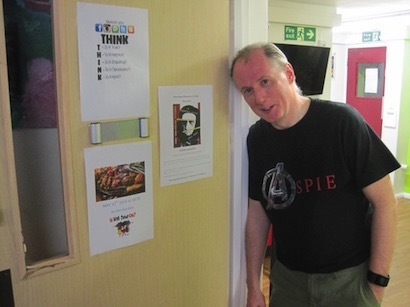 I played the Braintree discovery college foyer facility. This is a residential space for up to 35 young people to get their lives on track and develop. 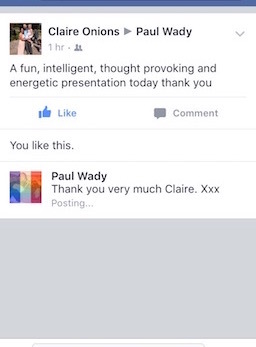 8th April I performed 10 minutes at the launch of a new branch of the National Autistic Society, in the Nottingham Town Hall. A branch entirely invented by autistic people. 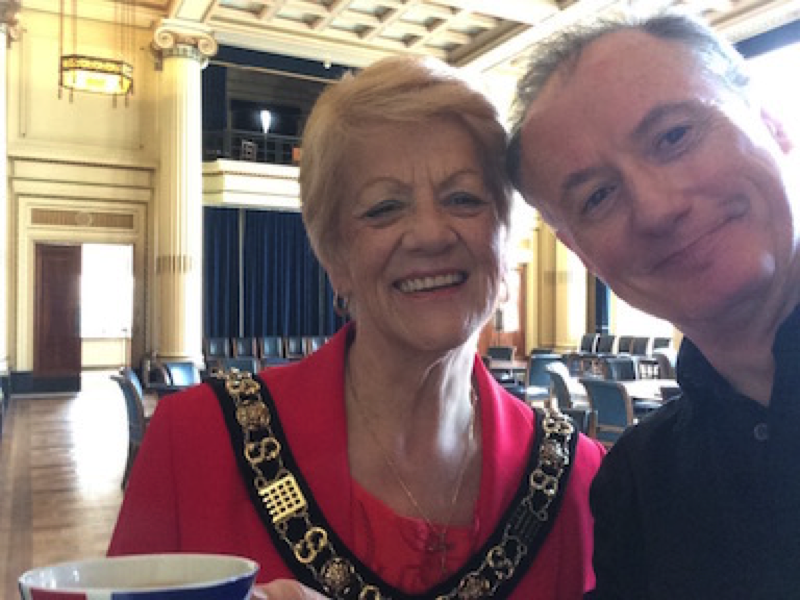 Walked into the ballroom and the Lord Mayor made me a cuppa. Great place. My friend Annette Foster, herself a unique neurodiversity performance artist and advocate, had a stall of her work and was present. Annette is going to be very big in our movement, if not already. 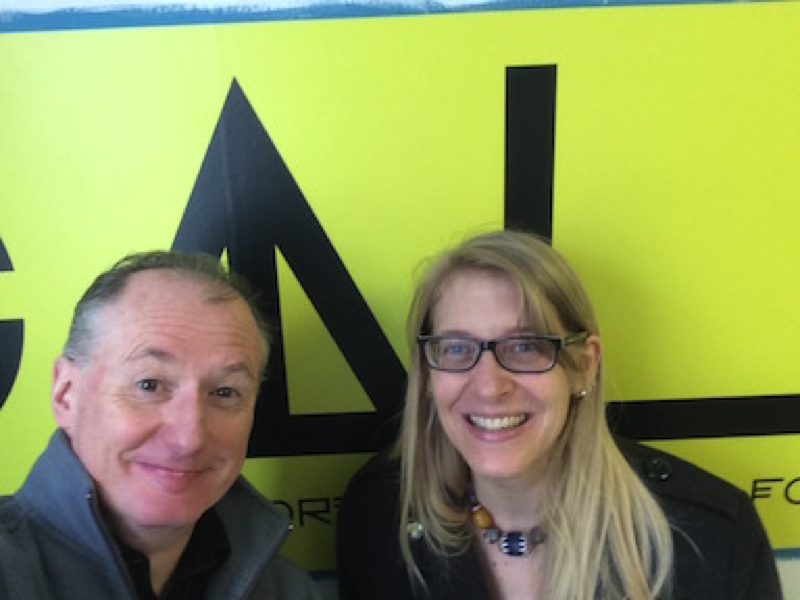 She took me to see the Guerilla Arts Lab there in Nottingham city centre, 25 Broad Street. A unique and important space, now more than ever. My friends Arran and Nikki, who invited me down to rave at the audience. They masterminded the launch event and created the group that went on to become a Nas branch. Everyone involved was on the spectrum. 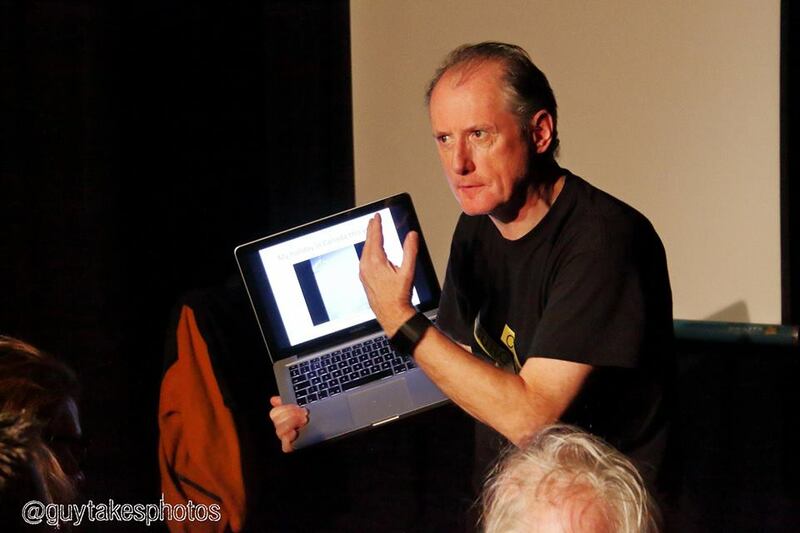 Cheers to Peter Mawson and his unique Tales from a Jam Jar performance which preceded mine. 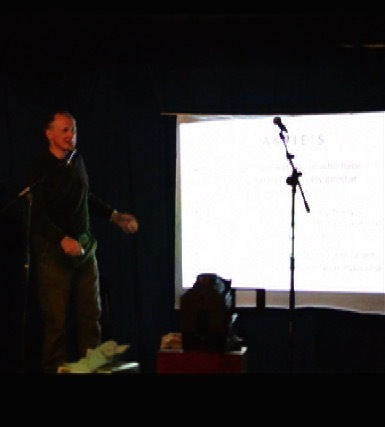 THE SWINDON FRINGE SHOW, March 2016. Great house in the Wyvern Theatre. 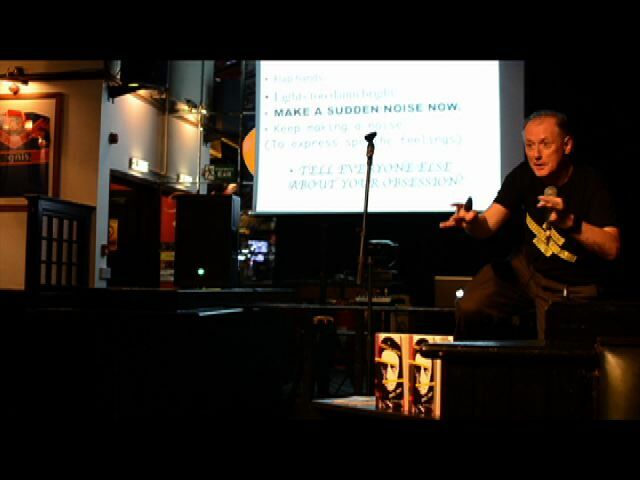 Thank you to the Swindon Fringe people I met there. 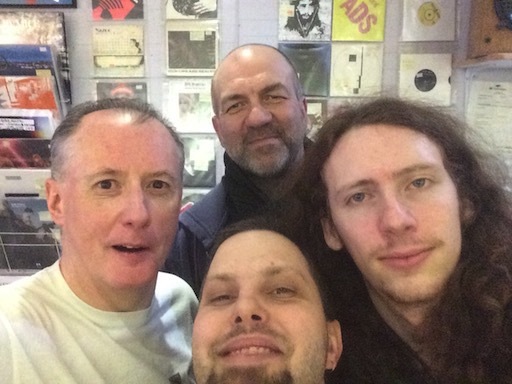 Vinyl Deptford yet again on the 12th March 2016. Yes, that really is Mr. Ray Gange. The Rude Boy himself. It felt like a royal command variety performance with Ray watching. Aaaah! (For those of you who have no idea, Rude Boy was The Clash’s film that came out in 1980. Click here, and shame upon you forever. Ray was the enigmatic lead actor). We had an amazing audience discussion throughout. As usual, since these shows became consistency moving and significant experiences for everyone as far as I could see. 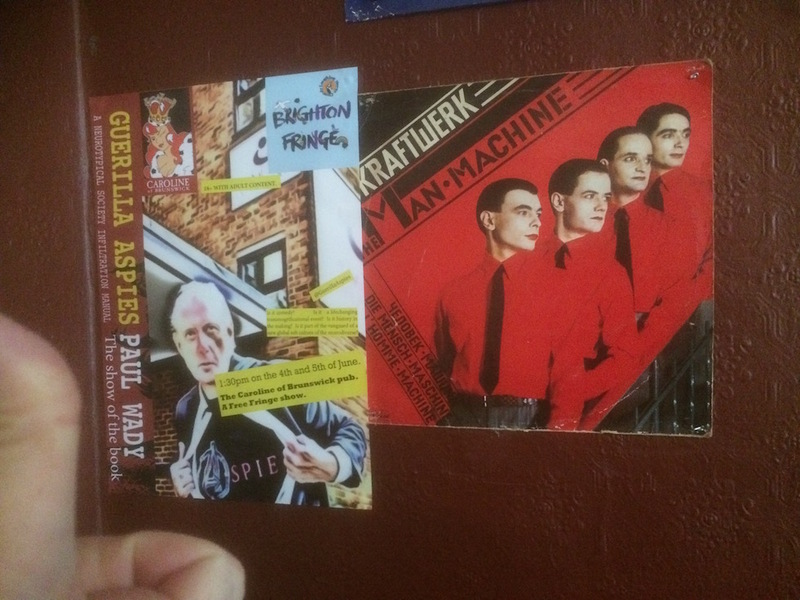 2014 and 2015 – The first shows. FINSBURY TAVERN 2014 – THE FIRST EVER SHOW, FOLLOWED BY THE MONTAGUE ARMS SHOW. 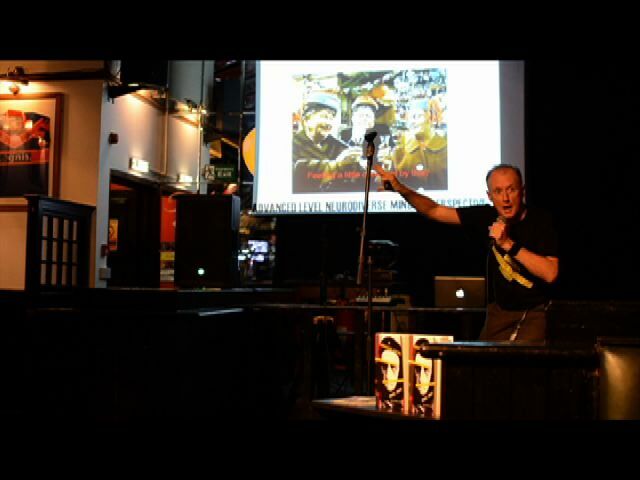 Back in 2014 I attempted a 7 minute slot on the Finsbury Arms, at one of the magnificent compere, poet and London gig orchestrator Vis the Spoon’s evenings. Thank you Vis. That went okay and a young teacher came up and asked if I could do it in her school. Oooh. The first kinda proper one was later on, in the legendary South London venue the Montague Arms. Love that place. There is film of this on my youtube. LINK!!! My fine friend Frog Morris had organized one of his over 100 occasions of performance there and I managed to do a 25 minute run of the bugger, which went down well. Not really audience interactive at this stage but still, it was there. The device you see in front of me is an actual magic lantern that Frog uses to tour his show together with ???? his working partner and co owner of a magnificent Winnebago cinema capsule like caravan. I started on the Montague as Edgar Allan Poe back in 2011, and still regard the old place as something of a home. Eddy played at the Stags Head pub too, courtesy of my pals Jude, Jo McCormack and Vis the Spoon the epic promoter. Some fun was had. 22nd February. Book launch at the Full Stop Café. When I tried to show the slides off the the video projector alone, and of course it malfunctioned. I had to speed through it at a pace of one slide every 3 seconds. 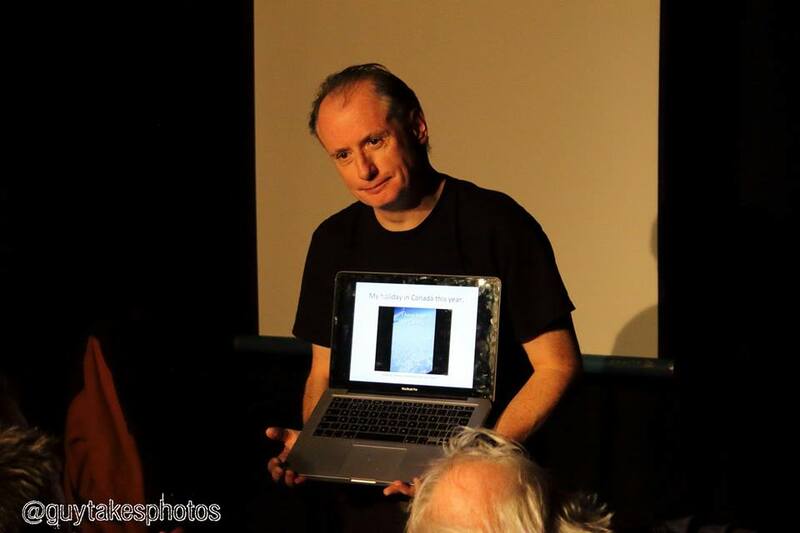 I shared the bill with a team of the talented, orchestrated by my pal Jude Cowan Montague who held a light up to my book when I found my eyes had reached that middle aged point of deterioration that I could not see the page in the half light. Thank you for that Jude and for organizing the event too. “A man can never get enough pictures of himself”. – PAUL WADY. There is invariably an epic life-or-death struggle with a microphone involved in setting up. You have to get the right angle of head-to-gob. Thereafter you may be compressing your larynx or stretching it too much. It is a fine art. Lemmy of Motorhead always sets his so his throat is stretched upwards, to get that rasping overdriven voice. 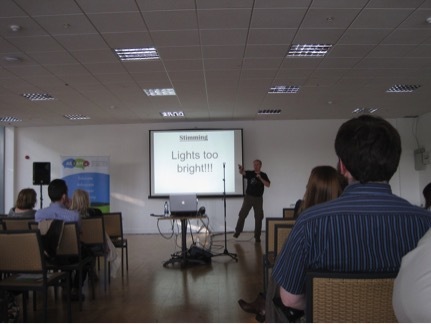 We all had family with light fitting that looked like that as children in the 60’s – and too long into the 70’s as well. Come the 80’s you tended not to spend too much time with such people… Ria Lina valiantly tried to wrestle with the remote later on. The machines had revolted and I had to machine gun the set. The place being full of people who knew me, I doubt anyone really noticed? The projection screen is an antique and a Wady family heirloom. My father used it to show our family 8mm Lauren and Hardy films upon for birthday treats. It is over 45 years old. 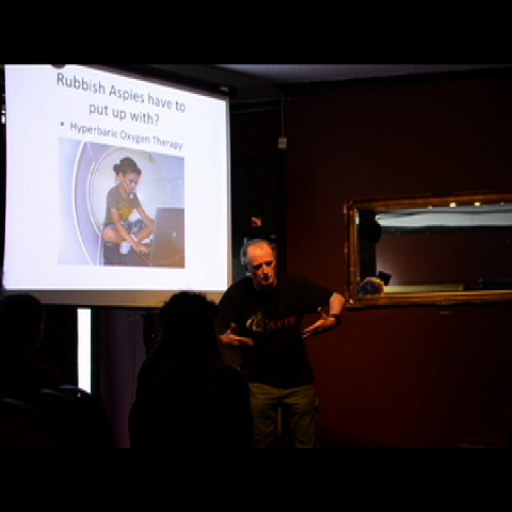 I lugged this bloody thing all the way to Edinburgh together with my huge 2000 lumin video projector, only to find a perfectly good monitor exactly where I wanted it by the stage. The venue there never answered my email in advance about technical set up in the room. Heh. First proper bit show on at the Cockpit theatre as one of their Theatre in the Pounds compendium shows. Everyone performs 15 minutes of their shows and the audience gives them feedback. It went better than I imagined it would. Actually I had not idea how well it would go and it was better than that. Thus I was primed to go on. The audience was full of people who were there to do their exerts too, and their friends. So I got very interesting and positive response. It was a point in the evolution of the show when I really needed that much encouragement as I had no way of knowing whether or not the project actually worked. The feedback during the performance and afterwards was so good and strong that thereafter I evolved what I now have today. So thank you to the Cockpit theatre in the Pound project, which is ongoing to this day. Try using it? 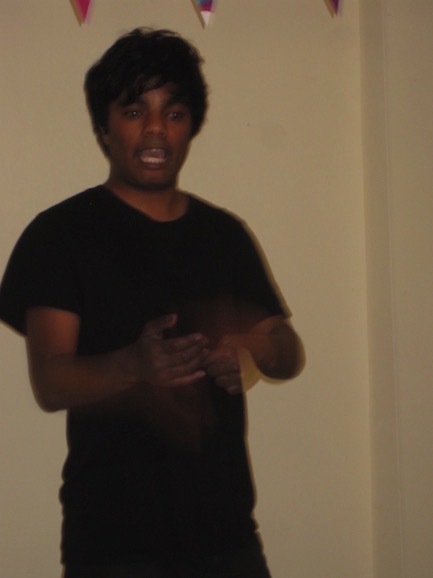 Don Biswas and I performed in the basement of the National Autistic Society. Don Biswas, manifesting ecoplasm in order to channel Bill Hicks and Lenny Bruce. 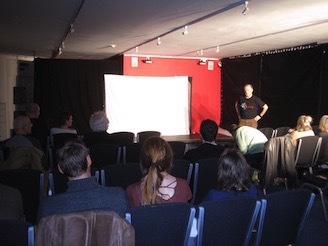 We did our pre Edinburgh Fringe Festival shows one after the other twice, at 2 and 6pm respectively. I have it in mind to try and get all of us performers in the same somewhat chilled venue at the same time in 2016. Interested? Just let me know on here. I always grab someone in the audience. 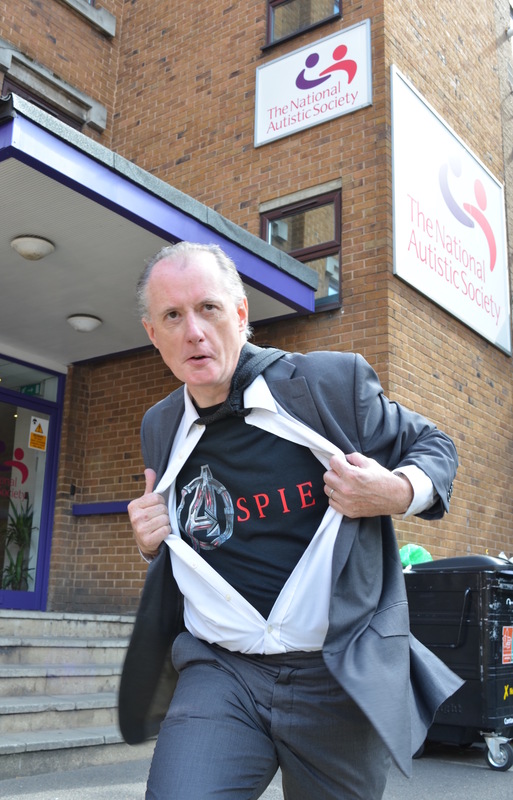 Actually this fine fellow is one of the principle architects of the Autism Act. Love him. We met on the aspie scene. Look for WrongPlanet.org for a start? Regional social groups and social media specific to your immediate area? Yep, things have been like this for a long time. 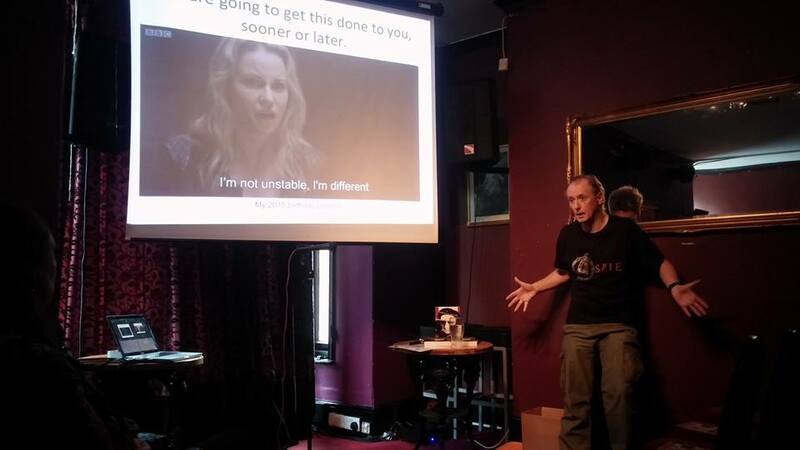 Autistic people have old established social environments and strengthen their own sub culture yearly. One aspect of this is that we don’t use the style that all people in all lands would assume was appropriate. We are always seen as mentally disabled but in our own worlds, using aspie style and mindset, we connect. Steve Silberman writes in his book Neurotribes that Silicon Valley California and NASA are practically ruled by us. So following on from all this, the shows challenge remains to communicate with humour all of the above in a way that does not alienate the audience. So far, this is the format that seems to work. 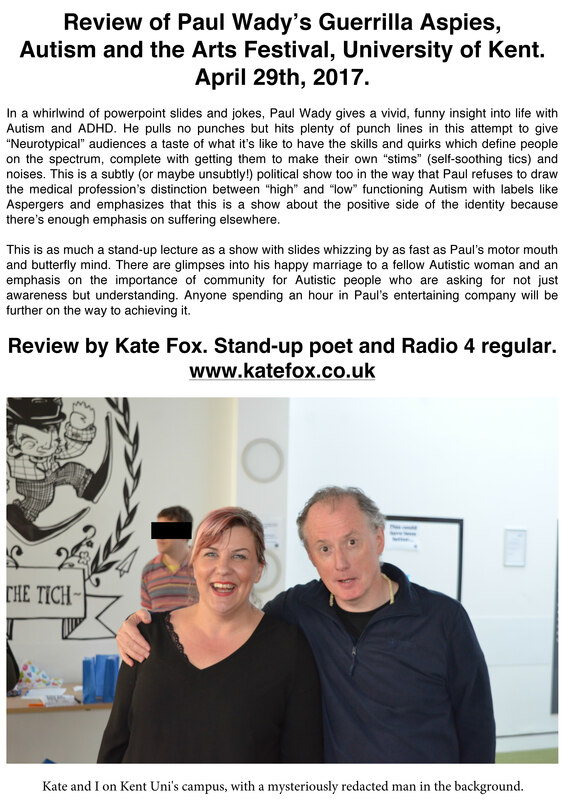 The acid test – the show at the Autism London social group, proved to me that it worked for my kind. How did I do that? Must be partly instinct after years of performance practice I assume? Feels good to get something right in life). My late friend the artist Tina Hibbins was there as well, and was welcomely vocal. My friend Catherine who is part of the show got to see herself too, as well as the marvelous master of ceremonies Mr. Frog Morris who put on my first staging of the show proper on the Montague Arms. 31st July 2015, Vinyl Deptford. My fine friends in the remarkable venue Vinyl Deptford, located in Deptford (which is just as well with a name like that) right by the DLR stop there, let me play the show on two separate dates, before and after Edinburgh. I love those guys in there, a shop/café/bar that sells only vinyl and a venue in the basement. With ties to the Clash and the true lineage of punk and new wave, these boys and girls are still creating a space in which anything could happen. Good vibes. Good decaf latte’s too. 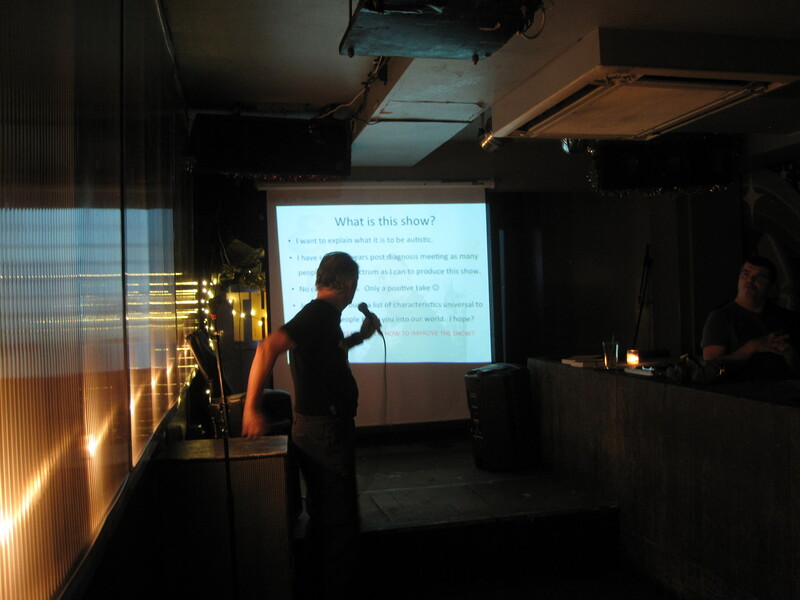 SHOW AT THE AUTISM LONDON MONTHLY SOCIAL GROUP. This was a very special show for several reasons. Alag was the first social group I joined when I got my diagnosis, December 2004. My first positive contact with a large group of autistic people. February 2005 I spotted a short woman in a light blue top talking to another woman in the corner of the room we used, by the sink. Over I cruised of course, ever looking for talent as a single predatory aspie. little did I know that the rather short woman (so no good to me) would marry me December 2007? The poor woman is still my wife and we went back to the group on the 4th August at the invitation of Ethney Anderson, who has kept it all going through thick and thin. I got an amazingly positive response from the audience who know the best. Blimey. It also taught me that a muted audience was not necessarily one that did not appreciate my show, and helped me learn not to constantly look for encouragement and positive feedback. I think there is a certain style of performing where you are trying to score points all the time and develop a cumulative atmosphere. This can easily be punctured by a bum series of gags or the audience interjecting. Or drying and corpsing etc. My show begs the audience to join in, and as usual I had one or two people in the front row who were great to dialogue with. More and more it became obvious that the more in the audience, the better the show. I finally found a good use for my great big Scouse gob. Great to see old friends from the very beginning when I first found out who and what I was. The tribe. 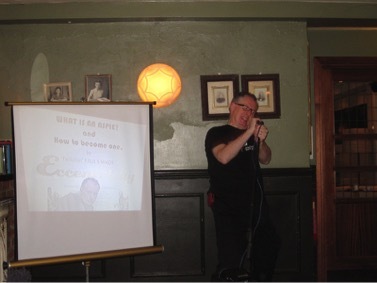 This was of course a pre Edinburgh show, and I was committed to playing the festival. 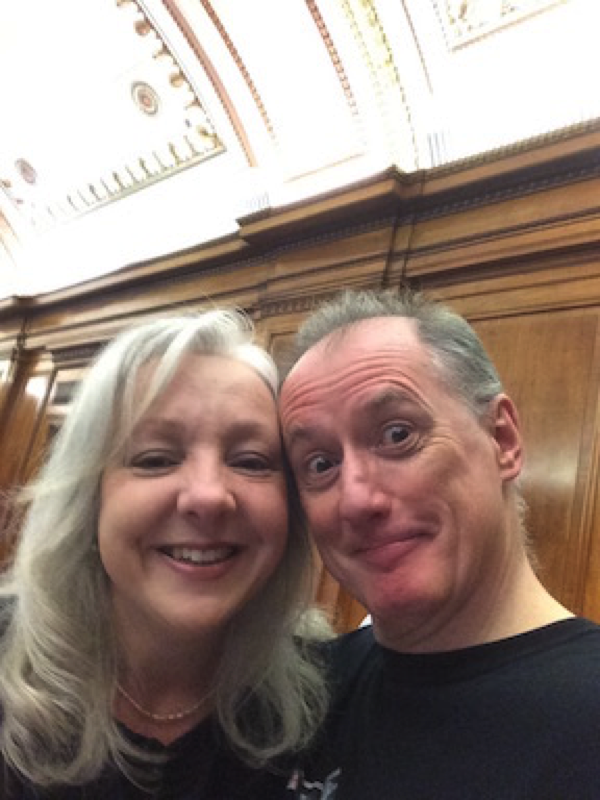 Days ticked over, and the time came…. More dots…. I paid out in advance from one of those zero interest credit card offers for a 4 bed flat to rent. I got ¾ of the cost back, and later on got 1/3 of that from Tinky Winky himself. Yes, the original Tinky Winky from the first cast of the Tellytubbies. Thank you sir and great to do business. I did not stay for the last week. Damn shame actually as I had such a good 11 days on the festival I should have gotten a full 3 week slot on the Laughing Horse free fringe. I was concerned to be away from my wife that long as her unique version of diabetes had been getting grim around the time of the year I organized everything. Also I had no idea if my Father may need me to come to him as he really is getting on. So I tried putting it out for the other three folks to pay the whole rent, which did not go down well on the Laughing Horse Facebook page. I told them the truth? I gave up on the idea and split it 4 ways. Mind you, if I rented it to 3 tourists I could have put a grand on the price? Instead I found three magnificent performers whom I would love to share with next year. Great crew. Louise, Jordan and Sara. I never did meet Tinky Winky. 2016? 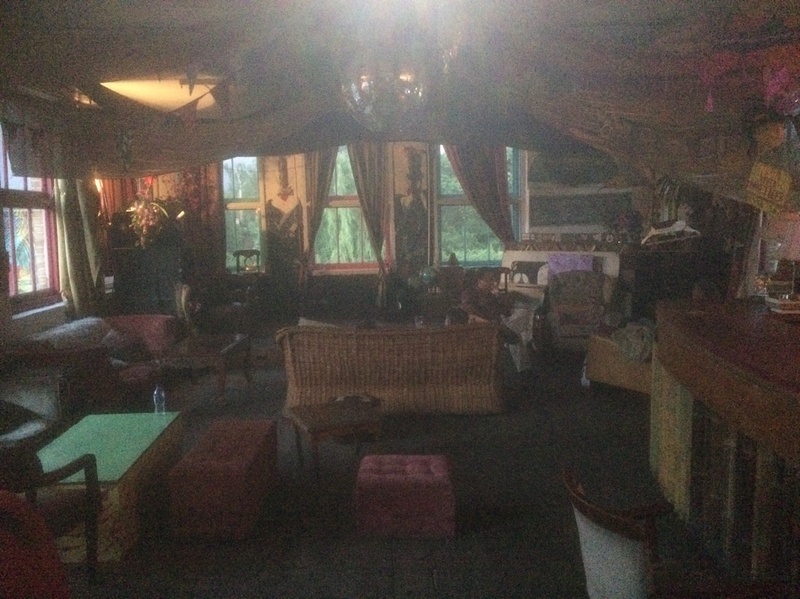 So when a 4 day slot came up at the Three Sisters venue, I took it. I would love to go back there too. No aspect of the experience was bad. I even spent 5 days sharing my room with an old Buddhist friend and we got on better than ever. Amazing. Rest assured next year, all being well, I want to do the full festival and have no objections from Mrs Wady if I take her along too. So far. This is the problem with marrying someone because their personality is monolithic and inscrutable. They cannot help but think for themselves to an extent that most people work hard to. As I have mournfully reflected, there was indeed a marvelous monitor there. Another performer thankfully pointed out a 3.5mm port on the thing that meant I could tap the audio off it, via the HDMI link. Technical details rule. Before the 11 am slot Don Biswas and I would be found flyering around the Royal Mile and roads around the Three Sisters, where we would end up making a last stand before I got ready to roll. After the show I would spend up to 2 hours talking to people, and thank you all for coming and meeting me. Then it was din dins and a period of flyering for the next day, after which I would peruse other peoples shows in order to be reminded just how wonderful I am. The show was well received by whoever talked to me about it, and the audiences were good. Very good actually. I was on 11am and it’s a time I would like to use again in 2016. Don Biswas the aspie comedian helped leaflet for me so many times, that the man is going to be begged to be paid to do it next year. He says he is not going, but I will use persuasion and if necessary blackmail to get him there. I will threaten to join the Conservative party. 14 people came to the first house, thirty odd the second, around 50 the third and 20-30 in the last one. Each time was more and more focused and I wish I had carried on, just to get the ongoing effect and see how I would end up doing it. 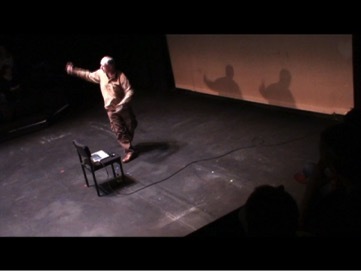 Each time of course was an encounter with the audience. So next year I intend to blitz the whole three weeks, and to Hell with being 52 and 2/3rds and angling for a heart attack. I even got the local lurgy virus before hand and had no idea until the second show when it cleared up. The trick is to stay in bed and prioritize the time of the day when you do the show. 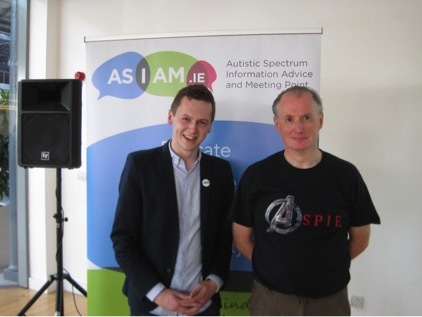 Aspie Adam Harris who created the AsIAm charity. I was flown over by the Abbey Theatre in central Dublin to play at the CHQ building in the centre of Dublin, to perform to 48 people of the AsIAm charity. This was set up by Adam, a young aspie, and has gone from strength to strength. As an old Scouser it is shameful to me that this was my first visit to Eire. 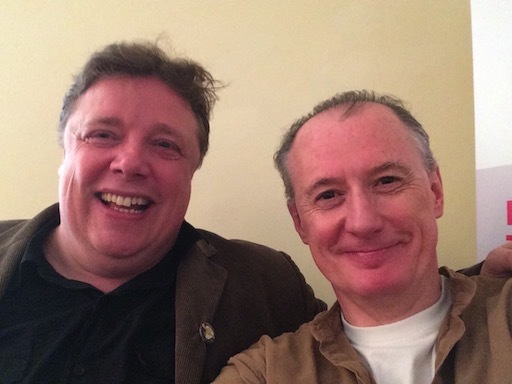 It was fine thing to catch up with my old pal Phil Kingston at the Abbey theatre, who brought me over as part of his remit to expand the portfolio of their outreach work. 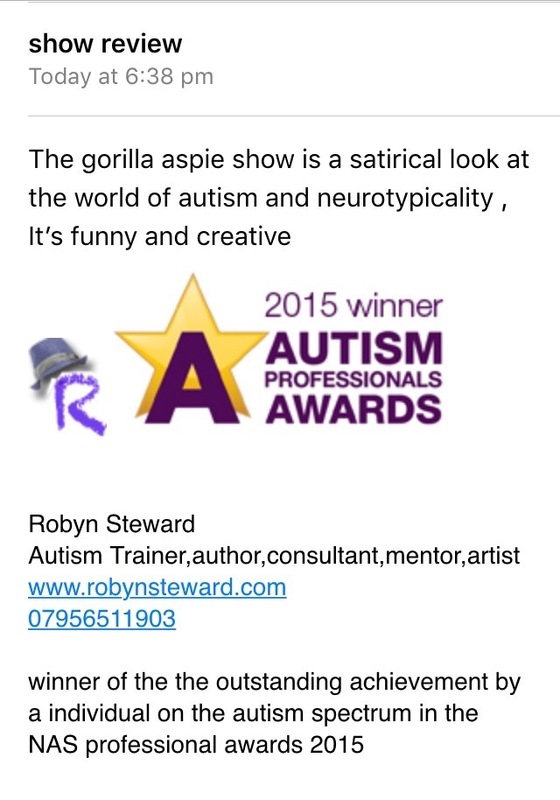 The Abbey became the first venue, and the first international one too, to take my work seriously and champion radical neurodiverse theatre and expression. This is like the first time anyone put a pro gay pride play on. Most of the show was done in tandem with an 11 year old aspie in the front row, and a small group of us at the back. My thanks to Teradactyl, a formidable 15 year old school girl (she still had her uniform on?) 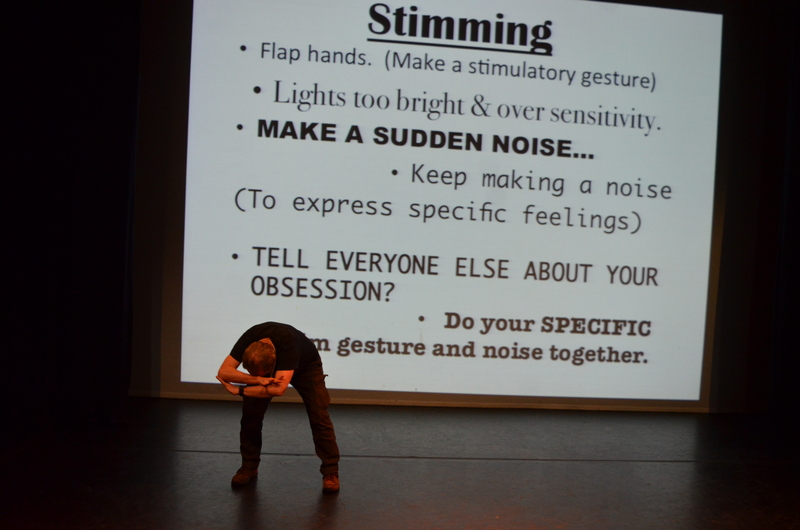 who taught me some marvelous stims from the audience mid show. I want to remember those. Afterwards the team running AsIAm whisked me off to dinner and talked more than I do. Amazing. Loved it. We should emigrate? I went to sleep in a central hotel that night, listening to raucous bar life and a next door male choir. Great people. Henshaws special needs college in Stargate, September 2015. 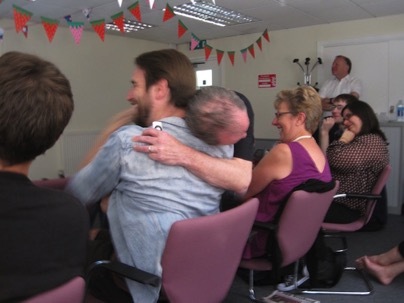 The most recent show was one morning in September in the Henshaws special needs college in Harrogate. 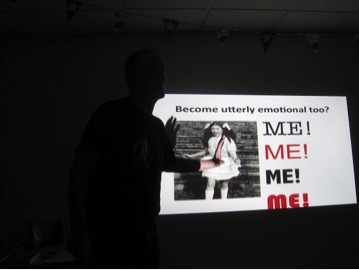 I had travelled from supporting my line manager in her autism training in Loughborough, and went there to deliver an hour of autobiographical experience. Great sentence that, eh? Basically means I get paid to go on about myself like the old drama queen that I am. Love it. Then I was off to a Premier Inn up country and the next day, did it on an even more profoundly overblown way. What a life for an old mentally disabled man? 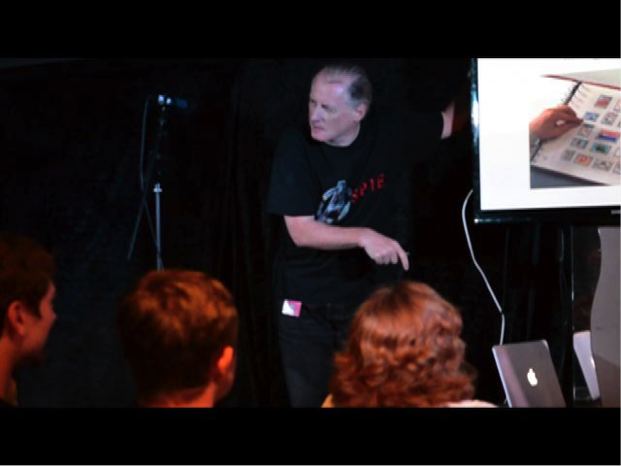 Same day I raced back to London (I ran up and down the train carriages…) to film Steve Silberman in the National Autistic Society head offices. 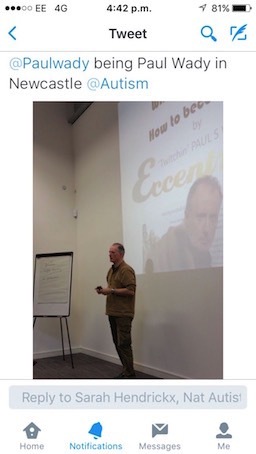 He was launching the magnificent NEUROTRIBES book, which is more important than mine. Al last we have a history of our kind written with respect, dignity and understanding. Buy it. Read it. Please. The show seems to be inspiring aspies. Alain English asked me to headline his Paper Tiger monthly poetry event in September too, when I just did 15 minutes reading from my book. It is touching and exciting to see people resonate and the innate self advocacy infecting others. 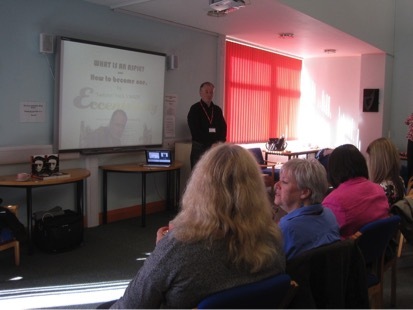 An audience of staff and people working with the Nas, and who seek accreditation for their work from us. No autistic people, but a good experience to do at ten in the morning. I was developing that ability to relate without needing some sort of sustaining feedback from the audience during shows like this rather than such as the Fringe or houses that expected and related to it as comedy and entertainment. 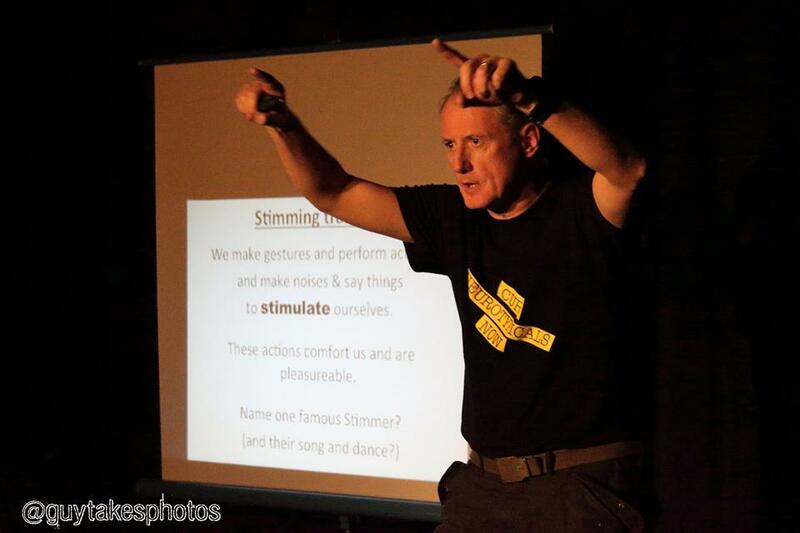 I performed at the Festival of Dyslexic Culture on the 10th October 2015. Annie the organiser is a dyslexia tutor at the London Metropolitan University on the Holloway road, where I spent my last year in my time at the place when it was the Poly of North London. Actually it converted to a university then so I technically graduated from one. I have lost the certificate which my parents had framed on the stairs in their old home. My brother says he has it. I am in no rush to retrieve it. I got to play the stage of what was once The Rocket, where the liks of Jah Shaka performed and the Jesus and Mary Chain did a 10 minute set and then went off, inspiring a riot. I got to bunk into the site of the old bar and former students union office, and stand grimly in the space once occupied by a world I was always at odds with. 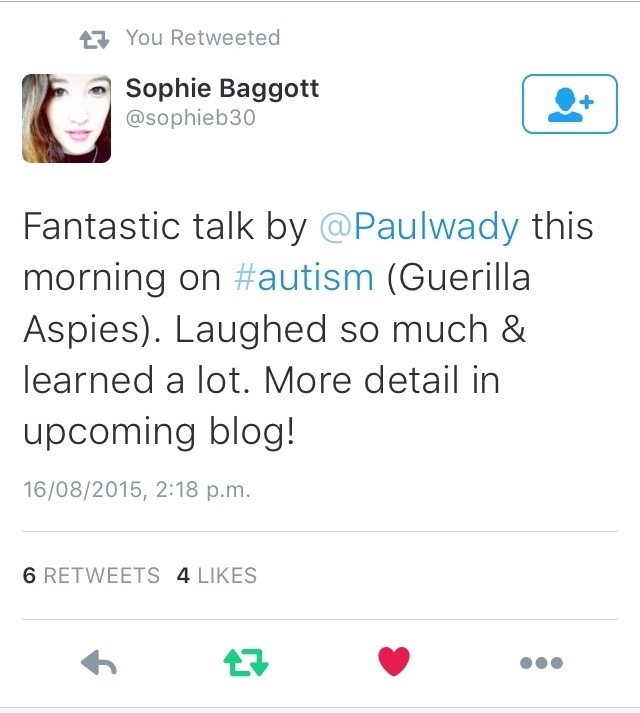 Some of the rubbish made up about me as an undiagnosed autistic (no one had any idea about neurodiveristy then. It did not exist and I had a relatively bad social act then) was horrendous. I still occasionally meet people who are scared of me. Better that than me of them. Hehehe. Me at about 7 in the morning…. I played the Saint Andrews secure unit school in Mansfield, Nottingham on the 4th November 2015. This venue is a secure unit hospital. I had to leave my keys and gear in reception and had sent the PowerPoint show ahead online. Back in 1978 the band The Cramps travelled 4,000 across the USA to play a show at the Napa State Mental Hospital, magnificent film of which is to be found online. Felt like the Aspie equivalent. I journeyed there wondering about the audiences reaction for once. In an ordinary venue you might get the odd criticism (I never do, and the show seems to be treated very seriously and preciously which is not necessarily good. I want to stimulate debate etc). 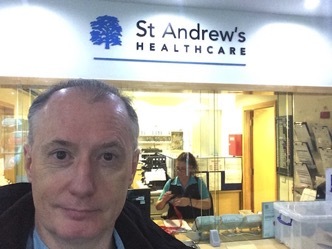 In Saint Andrews hospital, I thought they might keep me in on a section… I managed to dialogue with one of the patients who was in the audience there throughout. Radio alarms kept going off on staff’s belts. Good buffet laid on. Performing in such an environment has been an important lesson. Lets just say, I am glad I can be so sincere in what I do. 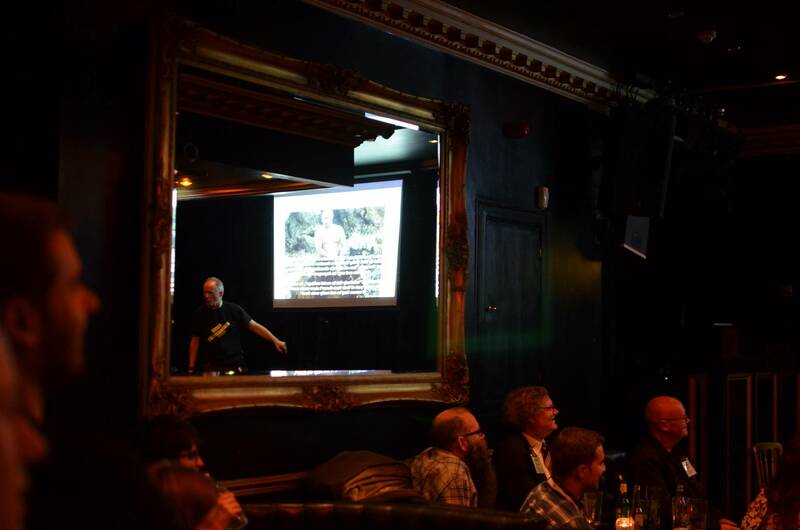 I played a NAS Supporters Meeting in the Newcastle area on the 19th November. Those of us aware of the saga of the British self advocacy organisations and their rise and fall, will find this particularly amusing and poignant. I played The Biscuit Factory venue to about 50 people. Sarah Hendrickx played too and I got to see her in action for the first time since we shared The Dragonfly bar back in 2013, in my first and rather bizarre performance at the Edinburgh Festival. Good to spend time with her. 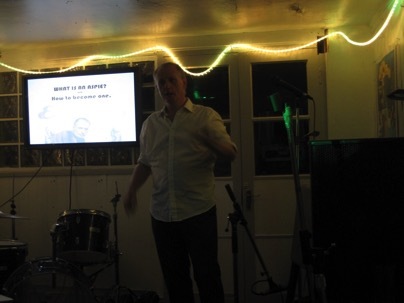 I also played a meeting in North London on the 11th. Then Stroud in Gloucestershire on the 27th. I am actually touring. Bizarre. Thank you very much to my employers for this opportunity to go on about myself to captive audiences. Here I got to see John William’s MY SONS NOT RAINMAN show, which was quite a thing. So I got to be on the bill with a parent. Fascinating for both of us to compare perspectives. John’s a mega dad and has given it all for his son, who is a character himself to be sure.